To Arosa on the "Ships starting with A" page. who adds that Arosa was named after the famous winter resort in Canton Graubünden. Built by A. McMillan & Son Ltd., Dumbarton in 1924. Previous names: Elmworth until 1937, Wind until 1938. According to this external page, she was delivered in Jan.-1924 as Elmworth to Dagliesh Stm. Sh. Co. Ltd. (R.S.Dagliesh Ltd), Newcastle. From 1937, sailed as Wind for W.Butler Wangs Rederi II A/S (W.Butler Wang), Tønsberg, then as Arosa for Skibs A/S Avanti (Tschudi & Eitzen), Oslo from 1938. Please follow the links provided for more convoy information. Where the "Convoy" column is left blank, it means that convoy is not known. Page 1 indicates Port aux Basques. Dispersed in 46N 55W, July 21. *Page 1 gives arrival July 25. *One of the above two entries should probably be deleted, or she may have missed Convoy WN 199 and returned to port, then proceeded independently the next day - See also Page 2. Convoy XM 25 from Holyhead. *The above 2 entries may seem a little strange, but what it probably means is that she left Milford Haven on Nov. 14 and joined Convoy ON 146 off Belfast - see also Page 3, which says she later arrived Saldanha Bay on Dec. 23, Durban Dec. 29. Detached to St. John's Febr. 11. *Convoy XB 138 did arrive Boston on Dec. 22, but Arosa arrived New York City Dec. 24 - see Page 4. (Stop at Puerto Padre not mentioned, Page 4). *One of the above two entries should probably be deleted. According to Page 4, she left Boston on March 23. According to Page 1 of the archive documents, Arosa was on her way from Los Angeles to Cristobal when war broke out in Norway on Apr. 9-1940. This voyage had started out in Iloilo on March 1 and her final destination was New York, where she arrived Apr. 23, remaining there for 3 weeks, before proceeding to St. John, N.B., where she also had a long stay. She later continued to Halifax in order to join Convoy HX 50 to the U.K. on June 13. Her destination is given as Falmouth on the convoy form, as Cardiff in the Advance Sailing Telegram, cargo of lumber, station 54. Having lost touch with the convoy, she proceeded to the U.K. alone, arriving Barry on June 26 and again had a long stay in port. A month later she joined Convoy OB 190, which originated in Liverpool on July 27 and dispersed on the 31st, Arosa arriving St. John's, N.F. Aug. 6. As will be seen when following the link provided within the Voyage Record, the Norwegian G. C. Brøvig, Gudrun, Snar and Varanger are also included. With a cargo of pit props, she's listed in the Sydney, C.B. portion of Convoy HX 70 in Sept.-1940 (convoy originated in Halifax on Sept. 1 - Hird was sunk, follow the link for details), and the following month she shows up, together with the Norwegian Reiaas and Rym, in Convoy OA 229, which departed Methil on Oct. 13 and dispersed on the 18th - again, see the external link in the table above. She arrived Three Rivers on Oct. 29, then proceeded to Montreal, where she arrived on Nov. 3, departing again on the 15th for Sydney, C.B., joining the Sydney portion of Convoy HX 90 on Nov. 22. The Commodore's reports and HMS Laconia's report are also available for this convoy, which lost several ships (follow the links for more info). Arosa, however, returned to port on the 25th, leaving the following day for Oban and Hull with a cargo of 2000 tons steel and 5000 tons timber in the Sydney portion of Convoy HX 91 - see also the Commodore's notes, where Arosa is mentioned. She became a straggler from this convoy and arrived Oban on Dec. 9, according to Page 1. She left the following day for Methil Roads, arriving there on the 13th (Convoy WN 52 - see link in record), departing Methil on Dec. 17, and on the 19th she received damages to her main engine (disabled) and had water in No. 5 hold after having struck a mine. She's said to have been in Convoy FN 414 (external link), 3 to 4 cables off Bull Fort (Humber), but this convoy designation appears to be incorrect; departure port and date was Southend, Febr. 22-1941 (arrived Methil on the 24th). She is, however, listed in Convoy FS 362 (also external link), which left Methil on Dec. 17. There's no mention of a mine in connection with Arosa, but the British Arinia is said to have struck a mine on entering Southend anchorage. There also seems to be some disagreement as to when Arosa arrived Immingham; one source says she arrived on Dec. 21 and was taken in tow that same day for Hull to be repaired, while Page 1 gives arrival as Dec. 19, with arrival Hull Dec. 21, remaining there until Febr. 21-1941. 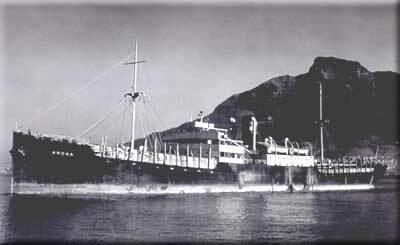 In March-1941, she shows up in the Gibraltar bound Convoy OG 55, which originated in Liverpool on March 7 and arrived Gibraltar on the 21st. Arosa, however, was detached from this convoy, her destination being Freetown, where she arrived independently on March 26. This convoy will be added to my Convoys section - in the meantime, the ships sailing in it are named on my page listing ships in all OG convoys. As will be seen, the Norwegian Atle Jarl (returned), Bello, Corvus, Frontenac, Thyra and Trolla are also included. In May that year she's listed as sailing in Convoy SL 74, which left Freetown on May 10 and arrived Liverpool on June 4 (the Norwegian Corvus and Taurus are also included; the latter was sunk; follow the link for details). Arosa subsequently remained in Liverpool for a month (Page 1), and we now find her, together with Evviva, Fanefjeld, Ferncourt (bombed - follow link for info), Grado, Henrik Ibsen, Idefjord, Måkefjell, Nesttun, Slemdal, Spurt, Star, Suderholm and Taborfjell, in Convoy OB 343, which left Liverpool on July 6 and dispersed on the 21st, Arosa arriving Halifax on July 25, continuing to New York that same day, arriving July 28. I've linked directly to both these convoys within the Voyage Record. Arosa later returned to the U.K. in Convoy SC 42, which left Sydney C. B. on August 30, escorted by the Canadian destroyer Skeena and 3 corvettes (among others). By September 19, 16 ships had gone down due to U-boat attacks (including the Norwegian Stargard), and several had been damaged. My page about this convoy has more details on the battle and the names of ships sunk. See also the external link below. Arosa's voyages in this period are shown on Page 2. It'll be noticed that she appears to have spent a month at Portishead. According to A. Hague, she later joined the westbound North Atlantic Convoy ON 30 (from Belfast), which originated in Liverpool on Oct. 26-1941, but she returned to port, arriving Oban on Oct. 29, continuing to Loch Ewe the next day. From Loch Ewe, she subsequently joined Convoy ON 32, originating in Liverpool on Nov. 1, arriving Halifax on the 16th. Arosa, however, was bound for Philadelphia, where she arrived on Nov. 21, having become a straggler from the convoy during the night of Nov. 6/7 (the Commodore says this ship was British, adding that she was 1 of 3 ships that "apparently have not the power for 10 Knots in smooth water, being only able to maintain a maximum speed of 9.6 Knots under ideal conditions"). About a week later, she proceeded to New York, where she remained for almost 2 months (Page 2). In Febr.-1942, we find her among the ships in Convoy SC 68 from Halifax (having been cancelled from the previous convoy, SC 67 in which the Norwegian Heina was sunk; again, follow the link for details), returning the following month with Convoy ON 74*, which originated in Liverpool on March 9 and arrived Halifax, Arosa's destination on that occasion, on the 25th. She had joined this convoy from Belfast Lough. Beth, Borgfred, Elg, Sirehei, Thorsholm, Titanian, Tortugas and Tungsha also took part. With a cargo of grain for Cardiff, Arosa was scheduled to return with Convoy SC 78 on Apr. 5, but instead joined Convoy SC 79 on Apr. 11, her destination is now given as Barry Dock. She stopped at Belfast Lough on Apr. 25, proceeding to Barry the next day and again had quite a long stay in port (Page 2). In May, she made a voyage to Montevideo, having sailed in station 11 of Convoy OS 29, which originated in Liverpool on May 22-1942 and included several Norwegian ships. Arosa's voyage information is given as Milford (left May 21) to Montevideo via Freetown with coal; she joined the convoy from Belfast Lough and arrived Freetown on June 11, Montevideo on July 6. Having made voyages to Rosario and Buenos Aires, she returned to Freetown, and with a cargo of wheat, she now joined Convoy SL 120, departing Freetown on Aug. 24, arriving Liverpool on Sept. 15. Follow the links provided in the table above - again, see also Page 2. In Nov.-1942, we find her in the westbound Convoy ON 146*, which started out Liverpool on Nov. 15 and had New York as its final destination, with arrival there on Dec. 8. However, Arosa's destination was Alexandria on that occasion. Several ships in this convoy were bound for Freetown or Alexandria or other ports, and I assume these ships would have left the convoy fairly early on in the voyage in order to proceed to their respective destinations. Other Norwegian ships in ON 146 were Ada, Boreas, Ingertre and Lido. According to Page 3, Arosa stopped at Saldanha Bay on Dec. 23, having sailed from Milford Haven on Nov. 14 - A. Hague says she had been detached from the convoy on Nov. 25. Via various other ports, she arrived Alexandria on Jan. 25-1943. The archive document shows her subsequent voyages. In June/July-1943, she's listed as sailing in Convoy SL 132/MKS 16, voyage from Buenos Aires (left June 1) to Loch Ewe, cargo of linseed. Audun, Mammy, Gabon, Dux and Kong Haakon VII are also named. Again, follow the external links provided in the Voyage Record for more convoy details (the MKS portion is also available on my own website at Convoy MKS 16). Arosa sailed in the SL portion from Freetown, departing June 28, and arrived Loch Ewe July 21, continuing to Hull that same day, where she subsequently had a long stay (Page 3). We later find her, with Bestik, Cetus, Elg, Iron Baron, Snar, Solstad, Tercero, Tropic Star and Vinland, in the westbound North Atlantic Convoy ONS 20*, which originated in Liverpool on Oct. 9 and arrived Halifax on the 26th, however, Arosa's destination is given as Miramichi (N.B.) - again, see Page 3 for information on her voyages at this time. With pit props for Garston, she was scheduled to return to the U.K. in Convoy SC 147 from Halifax on Nov. 19, but did not sail; as will be seen, when going to the archive document, she did not arrive Halifax until the next day. She was also cancelled from the next convoy on Dec. 2, SC 148 (Vice Commodore in Norhauk, sunk before arrival destination; follow link for details), but finally got away with Convoy SC 149 on Dec. 15. Her destination is now given as Immingham, where she arrived (via various other ports) on Jan. 3-1944 - see Page 4. She later joined the westbound Convoy ONS 28*, originating in Liverpool on Jan. 28-1944, arriving Halifax on Febr. 15, but according to A. Hague, Arosa had detached for St. John's, N.F. 4 days earlier, arriving there on Febr. 13. Solstad, Titanian and Velox are also listed in this convoy. Arosa subsequently remained in St. John's for quite a long time; departure is given as Apr. 18, when she (according to A. Hague) headed back to the U.K. in the Newfoundland portion of Convoy SC 157*, cargo of newsprint. It'll be noticed that she's not included on my page about this convoy, but it's possible that the ships joining en route are missing from my documents. Her subsequent movements are shown on Page 4. In June, she's listed in Convoy OS 81/KMS 55*, voyage Belfast-Pernambuco with coal. However, she returned to port (Belfast Lough), joining the next convoy, OS 82/KMS 56*, originating in Liverpool on July 1 - ref. links in the table above. Arosa joined from Belfast Lough and arrived Pernambuco on July 27. In Oct.-1944, we find her in station 73 of Convoy SL 173/MKS 64*, which arrived Liverpool on the 28th. Arosa had started out from Santos on Sept. 13, later taking up station 53 of the SL convoy in Freetown on Oct. 9, which joined up with the MKS portion from Gibraltar on Oct. 19 (Bestik joined with the latter portion). Arosa was bound for London with a general cargo consisting of rice, cased meats, coffee, hides, linters, cotton waste, leather, piassava, tobacco, cotton, sundries and 46 bags of mail. Further dates and details are available by following the links in the Voyage Record. The following month, she joined the westbound North Atlantic Convoy ONS 37*, originating in Liverpool on Nov. 28-1944, arriving Halifax on Dec. 21 - Arosa, however, arrived New York on Christmas Eve, and again had a long stay there (Page 4). Other Norwegian ships in this convoy were Bernhard, Norse Lady and Toledo. A. Hague has included her in Convoy SC 171* from Halifax on March 27-1945, but she put into St. John's, N.F. on Apr. 1, subsequently joining the next convoy, SC 172*, from there, cargo of sugar (convoy originated in Halifax on Apr. 6, arrived Liverpool on the 22nd). Her voyages in this period are shown on Page 5. Both these convoys had several Norwegian ships, namely Evanger, Grey County, Henrik Ibsen, Ima, Morgenen, Norsktank, Norvarg and Vinga in SC 171, and Annik, Glarona, Maud, Minerva, Norelg, Orwell, Sandviken and Solstad in SC 172. The archive document indicates that Arosa got to go home to Norway at the end of 1945, but arrival there is not given. * The ON and ONS convoys will be added to individual pages in my Convoys section in due course, along with further details on each. In the meantime, the ships sailing in them (and escorts) are named in the section listing ships in all ON convoys and on the page for ships in all ONS convoys. The MKS and KMS convoys will also be added; for now, see ships in all MKS convoys and ships in all KMS convoys. Additionally, the entire SC series will eventually be updated and completed, including the already existing convoys (some have already been updated); see ships in all SC convoys. Arosa sailed for Tschudi & Eitzen until 1949, but I don't know what happened to her at that time. She became Italian Enrico Mazzarella in 1951. This external page says she was owned by Soc. Siciliana di Impresse Mar. Enrico Mazzarella, Palermo at the time. From 1952, Sosimar-Soc. Siciliana Imprese Maritime, Palermo, same name. Sold for breaking up in Italy in 1960. Back to Arosa on the "Ships starting with A" page. The text on this page was compiled with the help of: "Nortraships flåte", J. R. Hegland, E-mails from M. Holdoway, E-mails from Tony Cooper, and misc.